This is a script that is so by-the-numbers that even high-powered actors (and a horse) have a hard time breathing life into it. Trailing the big hit Seabiscuit out of the gates, I'm sure Dreamer is in grand danger of being seen as guilty of hopping on the horse-drawn bandwagon. That said, I think pre-teen and little girls will just love this film. It's a nice film for a father to take his daughter to. Having a difficult time finding its pace, the film struggles to find its own strong stride amidst movie cliches. It really is a slim down version of Seabiscuit. Though watching the story through the eyes of a little girl makes Dreamer somewhat different. Just as schmaltzy, if not more, it lacks the fullness of production and richness of script. The relationship between father and daughter (and father and father) strain to give the film its own voice. But with very little attention given to the severed ties, the healing of those ties loses potency. That said, the scene where the father reads the little girl's creative writing story at parents' night absolutely had me in tears. It's a safe, though thin, feel-good story that fathers and daughters ought to have a look at. Dreamer: Inspired by a True Story. Copyright © 2005. 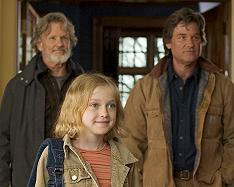 Starring Kurt Russell, Dakota Fanning, Kris Kristofferson, Elisabeth Shue, David Morse, Freddy Rodriguez, Luis Guzman. Written and Directed by John Gatins. Produced by Brian Robbins, Michael Tollin at DreamWorks/Hyde Park/Tollin/Robbins/Hunt Lowryramount.